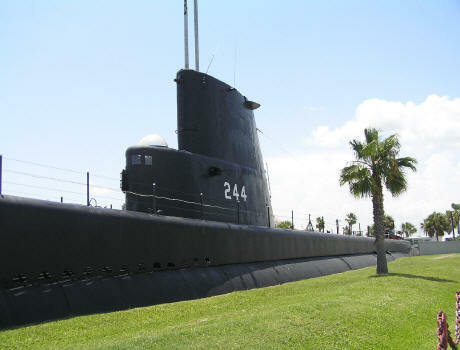 The USS Cavalla is berthed in Seawolf Park, Galveston, Texas as a memorial to the lost submarine USS Seawolf. Cavalla was a Gato class fleet sub, designed and built in the summer of 1943 by the Electric Boat Company and launched on November 14, 1943. She was commissioned on Feb. 29, 1944, the first "leap year" boat built by E.B. On June 19, 1944, on her maiden patrol, she sank the 30,000 ton aircraft carrier Shokaku (veteran of Pearl Harbor and Battle of Coral Sea). This earned her the Presidential Unit Citation. After the war, the Cavalla was decommissioned in 1946. She was brought back to service in 1951 and assigned to the Submarine Squadron 10 in New London, Conn. To meet the Soviet threat, she underwent conversion in 1952 to a new class of American sub--the SSK (hunter/killer). On January 21, 1971, the U.S. Navy transferred possession of Cavalla to the Texas Submarine Veterans of WWII. The Cavalla was then delivered to her permanent berth in Seawolf Park, Galveston, Texas. Gulf coast locals usually refer to the Cavalla as the "Seawolf", mistaking the name of the memorial park for that of the submarine on exhibit there. Next to her is the USS Stewart DE-238. Cavalla is currently enjoying a renaissance; volunteer efforts are at a ten year high, the local press has covered her history and renovation, and efforts are underway to bring her back to the proud state her crews maintained. Established Jan. 26, 1997; Webmaster: Neal Stevens, Houston, Texas. Last updated 06/14/2009. The USS CAVALLA WEBSITE and all its contents, photographs, artwork, and text is © 1996 -2017 by Neal Stevens.